Graduates from Samford University’s College of Health Sciences are uniquely prepared to combine their faith, skills and knowledge to positively impact the lives of individuals and communities. 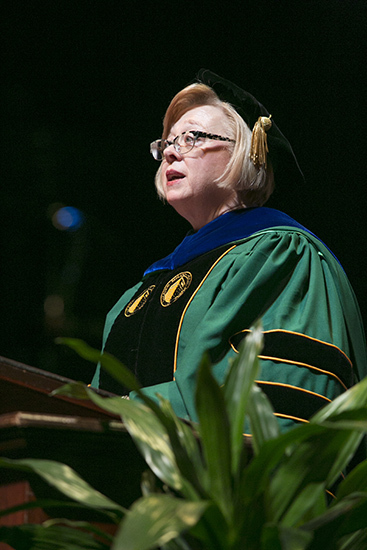 In a May 15 commencement address, College of Health Sciences Vice Provost Nena F. Sanders, challenged graduates to dedicate their careers to answering God’s call to a lifetime of caring for others. “By pursuing your calling, you will go on to more than just a career—you will create a life rich in opportunity and fulfillment knowing you make a difference in the life of each person you touch,” she said. “You will spend your career caring for individuals, physically, spiritually and emotionally. You will find an amazing number of opportunities that allow you to follow your passion for caring and service into careers you never dreamed possible,” she added. Sanders reminded graduates of the incredible opportunities that lie ahead of them. “There has never been a better time than now to pursue a career in health care,” she said. Sanders noted that health care careers accounted for seven of the top 10 spots on U.S. News & World Report’s 2015 ranking of the Top 100 Jobs in America, with almost all programs within the College of Health Sciences included in the rankings. Rankings were based on projected openings, rate of growth, job prospects, unemployment rates and salary and job satisfaction. In addition to her remarks, Sanders also shared two videos, one featuring nursing alumnus Jessica Johnson and the other featuring health professions alumnus Tori Beckham. The two stories that highlighted graduates’ ability to use their calling to make the world a better place and how Samford uniquely prepares them to do so. The College Of Health Sciences ceremony included 241 graduates from Ida V. Moffett School of Nursing, School of Health Professions and School of Public Health. Ida V. Moffett School of Nursing awarded 166 degrees, including 46 Bachelor of Science in Nursing, 87 Masters of Science in Nursing and 33 Doctor of Nursing Practice degrees. Masters students represented the family nurse practitioner, health systems management and leadership, nurse anesthesia and nurse educator programs. The School of Health Professions awarded 59 Bachelor of Science degrees and School of Public Health awarded 16 Bachelor of Science degrees. Retiring faculty member James Angel, professor of kinesiology, was recognized. Samford’s College of Health Sciences was established in 2013 to further the Samford mission while preparing students in an interprofessional environment for some of the fastest growing health care careers in the country. The college is comprised of four schools—Ida V. Moffett School of Nursing, McWhorter School of Pharmacy, School of Health Professions and School of Public Health. The May 15 College of Health Sciences ceremony was the third of six ceremonies taking place over three days. CHS’ McWhorter School of Pharmacy ceremony was held May 14.